Eddie Cass It is sad to report the death of Eddie Cass on the 17th September 2014, who many will remember for his folk drama research and publications. Eddie was a proud Lancastrian (the real pre-1974 county as he would always insist). He worked for a time in the mines before going on to a career in banking, ending with comfortable retirement in Manchester and time to pursue his interests. These interests were many and varied. He was a prominent collector of playing cards, and a social historian. His postgraduate research in the 1990s was on 'The Cotton Factory Times', a newspaper for Lancashire cotton operatives of the period 1885-1937. This led to an MA in 1992, followed by a PhD in 1996. Although he had seen his first Pace-Egging play in 1968, it was not until the late 1990s that his research interests turned to folk drama. 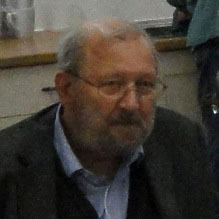 He will be particularly remembered for his books 'The Lancashire Pace-Egging Play: A Social History' (2001), and 'The Pace-Egg Plays of the Calder Valley' (2004), among numerous publications. Apart from Pace-Egging, he was interested in folk plays published in chapbook form, following a thread on printing history that ran through much of his research. 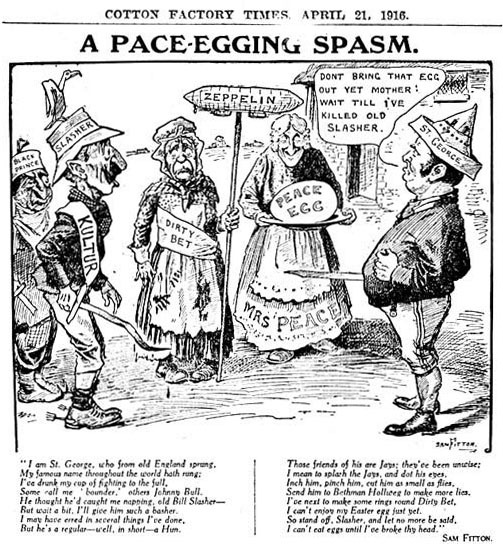 A Great War cartoon nicely combines two of Eddie Cass's major research interests. Eddie was a consummate speaker and attender at conferences and meetings, and joined many societies, often serving as an officer or committee member. Among these, he was at one time President of the Folklore Society and of the Society of Folk Life Studies, and chairman of the Traditional Drama Research Group. In the new Millennium, Eddie joined the James Madison Carpenter Project under the leadership of Julia Bishop, which aims to digitise the large collection of folk songs and folk plays collected by Carpenter mostly in the 1920s and 1930s. Carpenter was a US academic, and his collection is held by the American Folk Life Center, Library of Congress. The aims of the project are to digitise the collection and publish a critical edition in book form. Eddie's special responsibility was to deal with the hundreds of British folk plays in the collection. I understand that the relevant volume of the critical edition is ready for publication and hopefully will appear in 2015. It is a great pity that Eddie did not live to see the publication of his magnum opus.